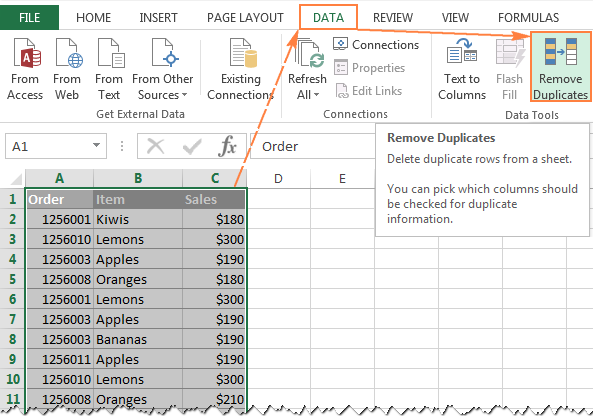 The tutorial explains how to remove duplicates in Excel 2016, Excel 2013, and Excel 2010. You will learn a few different techniques to find and delete duplicate values with or without first occurrences, get rid of duplicate rows, detect absolute duplicates and partial matches. Although Microsoft Excel is primarily a calculation tool, its sheets are often used as databases to keep track of inventories, make sales reports or maintain mailing lists. A common problem that occurs as a database grows in size is that many duplicate rows appear in it. And even if your huge database contains just a handful of identical records, those few duplicates can cause a whole lot of problems, for example mailing multiple copies of the same document to the same person, or calculating the same numbers more than once in a summary report. So, before using a database, it makes sense to check it for duplicate entries, to make sure you are not wasting time on repeating your efforts. In a couple of our recent articles, we discussed various ways to identify duplicates in Excel and highlight duplicate cells or rows. However, there may be situations when you may want to ultimately eliminate duplicates in your Excel sheets. And that's exactly the subject of this tutorial. If you are using the recent version of Microsoft Excel 2007, Excel 2010, Excel 2013 or Excel 2016, you have a bit of advantage because these versions contain a built-in feature for finding and removing duplicates called, not surprisingly, Remove Duplicates. This tool allows you to find and remove absolute duplicates (cells or entire rows) as well as partially matching records (rows that have identical values in a specified column or columns). To perform this, follow the below steps. Note. Because the Remove Duplicates tool permanently deletes identical records, it's a good idea to make a copy of the original data before removing duplicate rows. To begin with, select the range in which you want to ddelete dupes. To select the entire table, press Ctrl + A. With the range selected, go to the Data tab > Data Tools group, and click the Remove Duplicates button. The Remove Duplicates dialog box will open, you select the columns to check for duplicates, and click OK.
To delete duplicate rows that have completely equal values in all columns, leave the check marks next to all columns, like in the screenshot below. To remove partial duplicates based on one or more key columns, select only those relevant columns. If your table has many columns, the fastest way is to click the Unselect All button, and then select the columns you want to check for dupes. 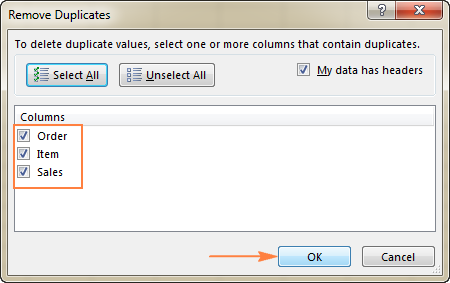 If your table does not have headers, clear the My data has headers box in the upper-right corner of the dialog window, which is usually selected by default. Done! All duplicate rows in the selected range are deleted, and a message is displayed indicating how many duplicate entries have been removed and how many unique values remain. Note. 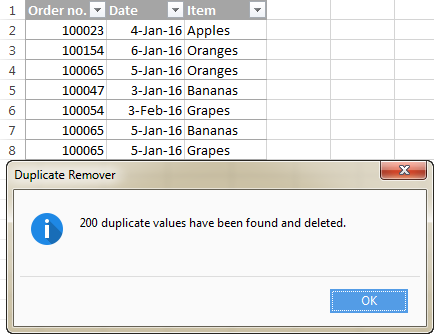 Excel's Remove Duplicates feature deletes 2nd and all subsequent duplicate instances, leaving all unique rows and first instances of identical records. 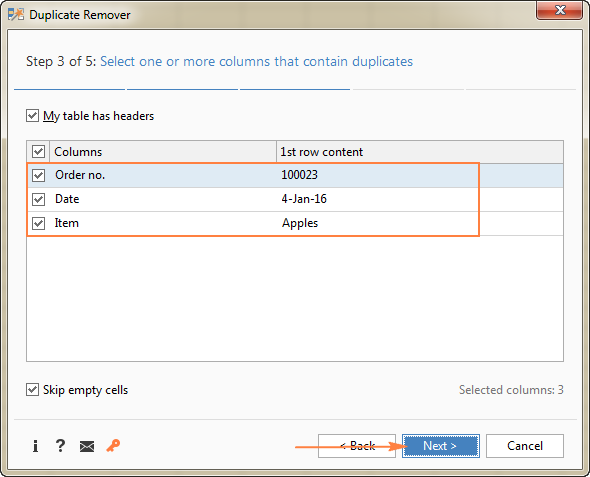 If you want to eliminate duplicate rows including first occurrences, use one of the following solutions: filter out duplicates with 1st occurrences or utilize a more versatile Duplicate Remover for Excel. Another way to get rid of duplicates in Excel is separating unique values, and copying them to another sheet or a different workbook. The detailed steps follow below. Select the range or the entire table that you want to dedupe. Navigate to the Data tab > Sort & Filter group, and click the Advanced button. Select the Copy to another location radio button. Verify whether the correct range appears in the List Range This should be the range you've selected on step 1. In the Copy to box, enter the range where you wish to copy the unique values (it's actually sufficient to select the upper-left cell of the destination range). Note. 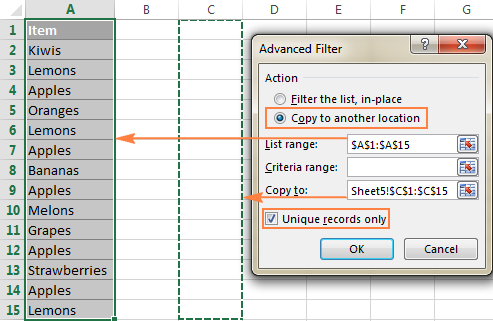 Excel's Advanced Filter allows copying the filtered values only to another location on the active sheet. 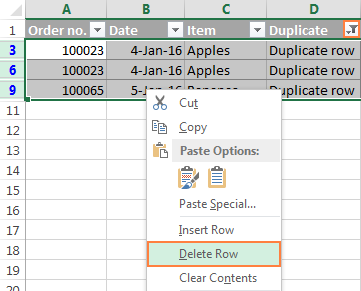 If you want to copy or move unique values or duplicate rows to another sheet or a different workbook, you can easily do it using our Duplicate Remover for Excel. One more way to delete duplicate values in Excel is to identify them using a formula, filter out, and then delete duplicate rows. An advantage of this approach is versatility - it lets you find and delete duplicate values in one column or duplicates rows based on values in several columns, with or without first instances. A drawback is that you will need to remember a handful of duplicate formulas. Where A2 is the first and A10 is the last cell of the range to be searched for duplicates. Where A, B, and C are the columns to be checked for duplicate values. 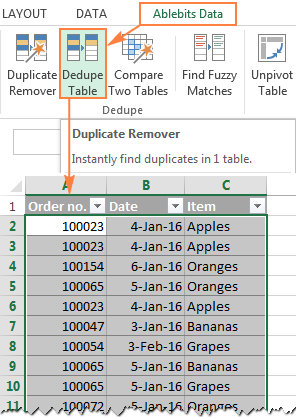 For more information about using duplicate formulas, check out How to identify duplicates in Excel. Select any cell within your table, and apply Excel's auto filter either by clicking the Filter button on the Data tab, or Sort & Filter > Filter on the Home tab. Filter out duplicate rows by clicking the arrow in the header of the "Duplicate" column, and then check the "Duplicate row" box.If someone needs more detailed guidelines, please see How to filter duplicates in Excel. In a similar manner, you can find and delete a specific duplicate occurrence(s), for example only 2nd or 3nd instances, or 2nd and all subsequent duplicate values. You will find an appropriate formula and step-by-step instructions in this tutorial: How to filter duplicates by their occurrences. Well, as you have just seen there is a number of ways to find and remove duplicates in Excel, each having its strong points and limitations. But what would you say if instead of those numerous duplicate removing techniques, you had one universal solution that wouldn't require memorizing a bunch of formulas and would work in all scenarios? The good news is that such a solution does exist, and I will demonstrate it to you in the next and final part of this tutorial. 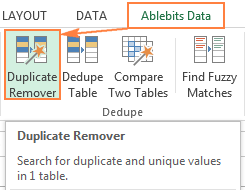 Unlike the inbuilt Excel Remove Duplicate feature, the Ablebits Duplicate Remover add-in is not limited to only removing duplicate entries. Like a Swiss knife, this multi-tool combines all essential use cases and lets you identify, select, highlight, delete, copy and move unique or duplicate values, absolute duplicate rows or partially matching rows, in 1 table or by comparing 2 tables, with or without first occurrences. It works flawlessly on all operating systems and in all versions of Microsoft Excel, including Excel 2003, Excel 2007, Excel 2010, Excel 2013 and Excel 2016. In a moment, you will see how quickly and efficiently you can find and eliminate duplicate rows or identical cells in your Excel sheets. Select any cell in the table that you want to dedupe, and click the Dedupe Table button on the Ablebits Data tab. Your entire table will get selected automatically. 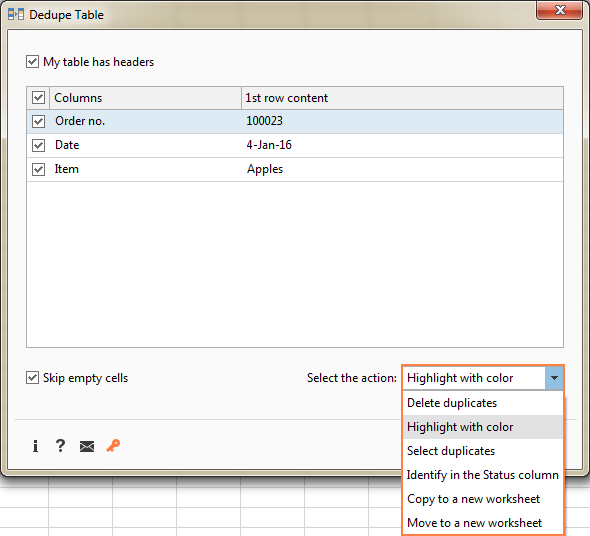 The Dedupe Table dialog window will open, and all the columns will be selected by default. You pick Delete duplicates from the Select the action drop-down list and click OK. Done! Tip. If you want to remove duplicate rows based on values in a key column, leave only that column(s) selected, and uncheck all other irrelevant columns. 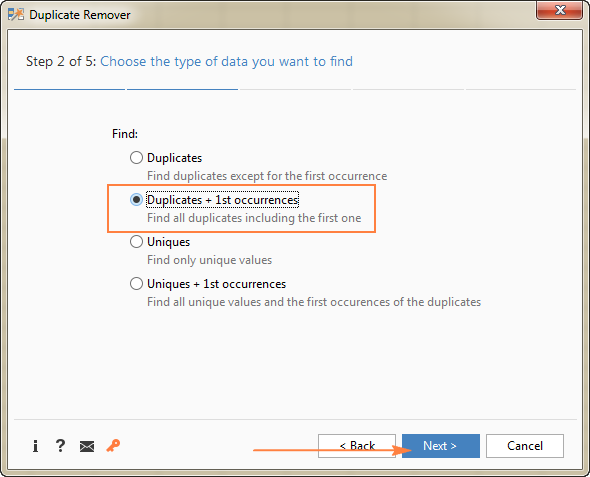 If you want more options, such as deleting duplicate rows including first occurrences or finding unique values, then use the Duplicate Remover wizard that provides all these features. Below you will find full details and a step-by-step example. 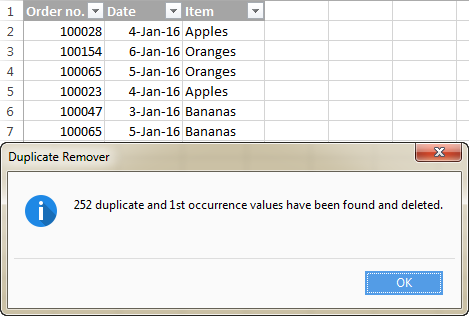 Removing duplicates in Excel is a common operation. However, in each particular case, there can be a number of specificities. While the Dedupe Table tool focuses on speed, the Duplicate Remover offers a number of additional options to dedupe your Excel sheets exactly the way you want. 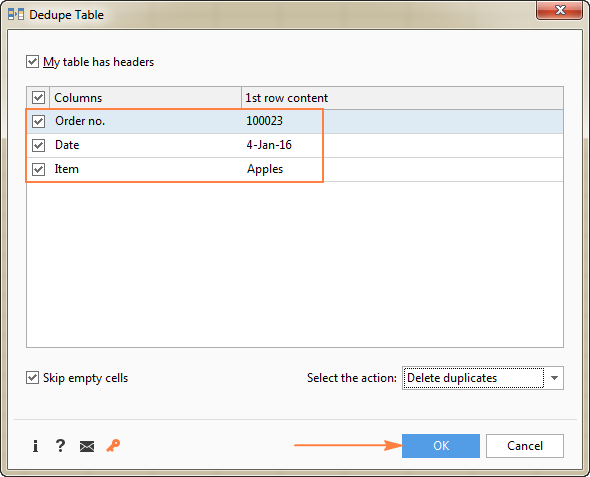 Select any cell within the table where you want to delete duplicates, switch to the Ablebits Data tab, and click the Duplicate Remover button. 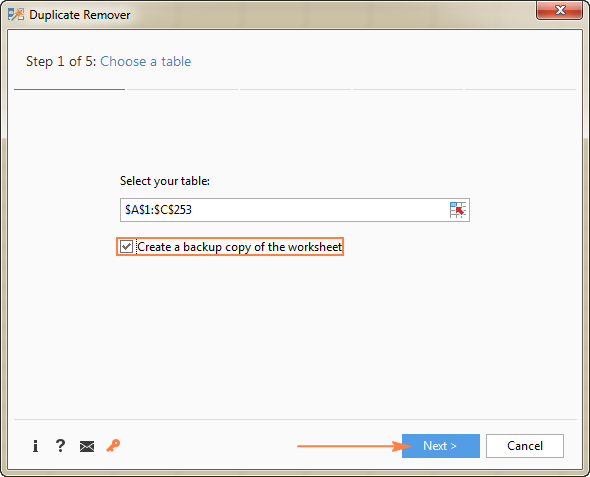 The Duplicate Remover wizard will run and the entire table will get selected.The add-in will also suggest creating a backup copy, and because you are going to permanently delete duplicates, we strongly advise that you check this box. Verify that the table has been selected correctly and click Next. And now, select the columns to search for duplicates. Because our aim is to eliminate duplicate rows, be sure to select all the columns (which is usually done by default). Finally, select the action you want to perform on dupes and click the Finish button. In this example, we expectedly choose the Delete duplicate values option. That's how you can wipe duplicates off your Excel. I hope at least one of the solutions discussed in this tutorial will work for you. And if you are interested to try our deduplicate tools, I encourage you to download a fully-functional trial version, and let us know your feedback in comments. If you like our Duplicate Remover add-in, we will be happy to make you an exclusive 15% off offer. Just use the following coupon code on the order form: AB14-BlogSpo. 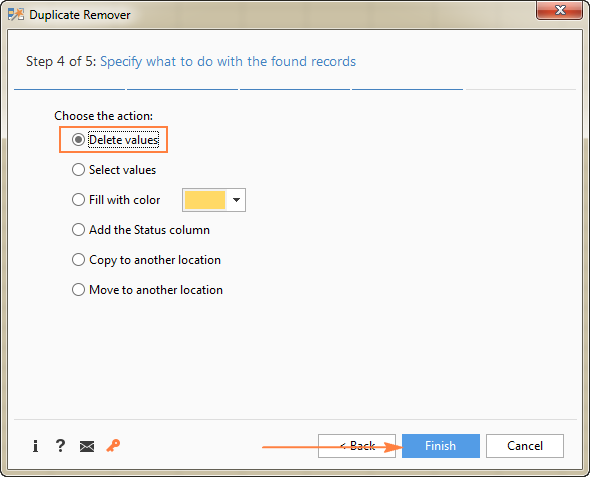 It is valid for Duplicate Remover as a separate product and as part of Ultimate Suite for Excel. 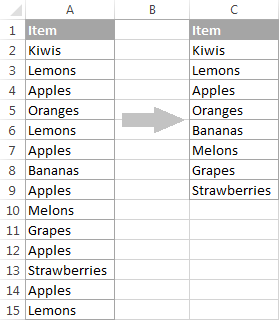 9 Responses to "How to remove duplicates in Excel (duplicate rows, values and partial matches)"
I'm looking for a solution to mass delete a cell that appears in a row with the same value twice the spread sheets we have are 10,000+ rows and it is very tedious to remove them all by using conditional formatting and going through it by hand. The sheet contains contact information and sometimes the numbers are listed twice for the accounts we have and to stop them from being loaded into our software twice we have to go through and delete them out of the sheet first. The problem with just deleting them using the remove duplicate tool is that the person may have two separate accounts and it would remove the phone number from a row further down the page. How i can remove one of repeat (text or numbers) from a cell. I am looking to delete duplicates in one column in separate rows but keeping the additional values in different columns of each row and create a total new list. By the way, thank you for all these! I am looking to find duplicates and sum the duplicates in the same column . is there any vba for this?? I have quite a large spreadsheet and I need to remove items with more than 3 duplicates. How can I do that? I learnt to find the duplicate in a excel sheet, now i want to rearrange the 2 duplicate values in a same row. Can somebody help on it?